on people's head. - Thank you Spider-Man ! I love Marvel comics and I like Spider-Man quite much. 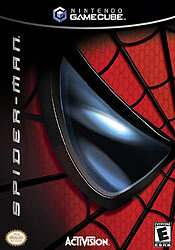 When such a good director as Sam Raimi decided to make a movie of it, I thought it was great. For several reasons, I've never seen the movie though, one of them was that I don't like the look of the Hobgoblin (it's not good at all compared to the comic). Anyway, I played the game through and I must say it was really bad. That's maybe why I felt more like talking about the movie that I haven't seen, err. 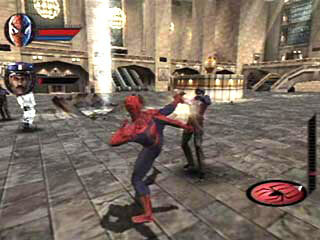 Spider-Man on 128 bits has been selling and renting quite well, and I just can't understand why. Sure it's fun to be Spider-Man, to have his powers, to walk on the walls and the ceilings, to swing like Tarzan being Spiderman (ah ! ), but the game has just no fun, it's deadly boring; "follow this guy", "destroy 10 then 20 then 50 of these", the objectives of each mission are so directive and uninteresting that when you have finished them once you wish you never play them again. Except for its main part, the training, which is full of mini-exercises is just as plain boring as the rest. You are supposed to beat some records, I don't see the use, you can't save anything and it's all so damn long. Oh boy, I don't regret not to have this game anymore. The best thing about Spider-Man, because there's one still, is the technical quality: good graphics, good animation, good sound and truly excellent voice acting from some of the actors of the movie (Tobey Maguire, Wilhem Dafoe, cool !). You got a nice thrill also the first times that you swing high above the city, around the skyscrapers. Unfortunately, the fun in the game is dead and buried so it's even hard to enjoy this, especially that the controls are average and the camera control is awful. I don't think this game will be remembered in a few months (it seems it's already forgotten), it just doesn't deserve it. "Orphaned at a young age, Peter Parker, a good-hearted teenager, lives in Queens, New York with his aunt and uncle. On a school trip to a research institute, Peter Parker is bitten by a genetically engineered spider and soon discovers that suddenly his vision is perfect and his previously scrawny body has become muscular-he now has incredible strength, and his hands mysteriously adhere like glue to everything. Peter soon learns how to control his spider-like powers, and transforms into the amazing Spider-man, out to protect the city from a never-ending supply of evil villains and perilous events." 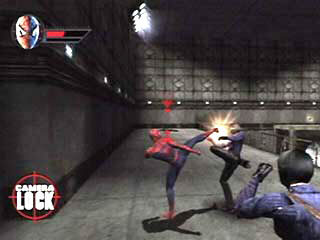 "- Assume the role of Peter Parker and his alter-ego Spider-man to defend the city from the clutches of evil. - Master all-new combat moves and dizzying airborne acrobatics. 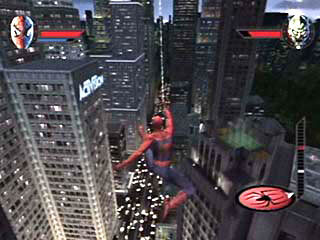 - Move through stunning scenes from the movie as you explore enormous city environments with newfound maneuverability. 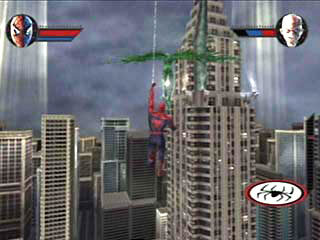 - Battle the world's toughest villains, including Shocker, Vulture, and the Green Goblin."